KOKOMO, Ind. — Indiana University Kokomo is partnering with area schools, business leaders, and Ivy Tech Community College to help reach the Indiana Commission for Higher Education's goal of 60 percent of state residents attaining post-secondary education. Teresa Lubbers speaks at the town hall meeting. 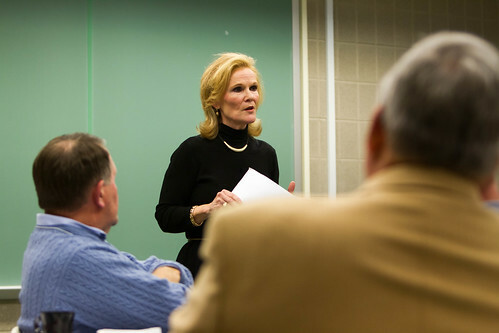 Teresa Lubbers, commissioner for higher education, said she was "very excited" about the collaboration she sees happening in Howard County, during a town hall meeting hosted by the local Coalition for College Success at IU Kokomo. "It's clear there are active partnerships in place," she said. "We need K-12 schools, colleges, and business working together for our students to succeed." Lubbers said it used to be a student could graduate from high school or not, and with a good work ethic and effort, live a secure, middle class lifestyle. Now, some kind of post-high school education is required. Interim Chancellor Susan Sciame-Giesecke said the Kokomo community is very interested in its students' success, and has participated actively in initiatives to prepare students for college. "I really believe it is our mission to take a leadership role in these collaborations to help our students succeed in post-secondary education," she said. She said IU Kokomo is already actively working to promote graduating in four years, another mission supported by the state commissioner. She cited the Complete in Four program, which kicked off this fall with a goal of helping students map out a plan to take the classes they need to graduate on time. "We understand the importance of knowing when they're going to graduate," Sciame-Giesecke said, "How can you reach a goal if you haven't defined the goal?" She also talked about revamping summer school, to make it more a part of the school year, and plans to offer a Maymester, a four-week immersive learning experience. The campus also has a mentoring program with juniors and faculty, promoting conversations about the students' future plans, both for their last two years and after graduation. "We keep trying to think of innovative ways to help our students achieve success," she said. Pennye Siefert, assistant superintendent of the Kokomo-Center Schools, said IU Kokomo partnered with Kokomo High School to prepare students for college-level math. Campus staff administered a math placement test to more than 700 seniors, and results are being used to offer remediation to those who need help. "If they aren't ready for college math, they have to take remedial classes in college," Siefert said. "That often results in defeat, as the students drop out. We believe this is one way we can make sure our students are prepared for college. We would like to expand this program to other areas." Steven Daily, chancellor of Ivy Tech Region 5, said the partnership between the community college and IU Kokomo is critical, making it easier for students to continue past an associate's degree. "We are continually working together to communicate to our students not only that they can move on, but they must move on," he said. Lubbers said financial education will be a critical part of the equation, helping parents and students understand what it will cost to go to school, that they need to start saving early, and what impact borrowing will have on their futures. They also need to be prepared for college, so they don't drop out with debt and nothing to show for it. Lubbers said plans must be in place to address the needs of adult returning students and children who are the first in their families to attend college, including those in the 21st Century Scholars program. The state program provides tuition at a state public university to students who sign up in middle school, graduate with a 2.0 grade point average, and meet other requirements. She said most of these are first-generation college students, and they need support all the way to college graduation. Currently, 33 percent of Indiana residents have a post-secondary degree, ranking the state 41st of 50. Lubber said it is no coincidence that Indiana also ranks 41st in per capita income. "There needs to be a sense of urgency if we want Indiana to be the kind of place we want it to be," she said. "We need people with more of every kind of post-secondary education."